VW Camper Hire Company Description: Beacons Campers is a small family run Motorhome and campervan Hire company located at the foot of the Brecon Beacons. We are a well established company that has been operating sucessfully for the last 5 years with a lot of repeat customers, unlike many large companies who would only offer a 9-5 service we are available to our customers (whilst on hire) 24/7 so providing unrivaled customer care from start to finish of the hire period. Motorhome and Campervan Hire is our only interest, this enables us to put all of our energy and concentration into making your holiday adventure as enjoyable as possible. All vans are maintained to an extremely high standard, with habitation check, gas check and servicing periodically carried out by authorised dealers. Our current fleet consists of a Autotrail Apache 700 6 berth, Adria Sport A 660 DP 4/6 Berth luxury motorhomes, 3 x VW T5 Transporters and a 1966 VW Split Screen. All of our vehicles are specified to the highest standard with the highest luxury options being taken with each vehicle purchased, this is both to make your holiday more comfortable and also to enable us to offer extras that are not offered by the majority of our competitors. Our VW T5 Transporters are converted to an extremely high standard by Cannon Camper Converstions who are professional, well respected and have been established since 2005 with over 30 years experience in the trade - www.cannoncamperconversions.com We are ideally placed for exploring the Welsh countryside whether it be the Brecon Beacons or the coastline of the Gower all of which are reachable within an hours drive of our location. Our vans have been to many destinations including travel to Scotland (Ben Nevis, Cairngorms and Orkney Islands) Monte Carlo, Switzerland, Austria, Portugal, Spain (Salou, Barcelona and Tarragona) and both Northern and Southern France. Adventures they have been on include: Tour De France, Skiing in the Alps, Triathlons on the Italian Border, Motorcross Racing, Disneyland Paris, Six Nations Rugby, 3 Peaks Challange, Charity Bike Rides and Events, Festivals, Photo Shoots and Film Sets Special Occassions, Birthdays, Anniversaries, Honeymoons, Engagements & Weddings all catered for just let us know when you book. Included in our rental is everything you need to make your journey a home from home experience. All of our vans come fully insured for 1 driver aged 25 - 75 with no more than 6 points endorsed on their licence and use within the UK, although other drivers and European cover can be added at an extra cost, also included is roadside assistance, first aid equipment and a fire extinguisher, along with your usual everyday items which are listed in the itineraries. Each rental will receive a comprehensive handover so you are comfortable with driving the vehicle even before you leave our yard, whether you fancy a holiday with a difference or fancy trying a camper holiday before you buy we will do all we can to make your holiday an enjoyable and memorable experience. 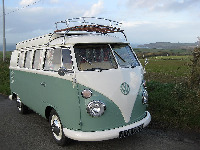 VW Camper Hire Company Description: We are a friendly, family run VW camper van hire company, based in Mid to North Wales, situated in the Tanat Valley, amidst some of the most stunning Welsh scenery. 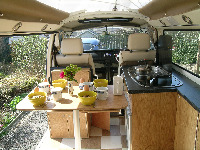 We invite you to hire a fun VW campervan. It will give you the freedom to discover the very best of Wales and its borders. Take it easy and go where you want, when you want. In a VW camper van you can kick back and relax on one of our stunning beaches, picnic by a spectacular waterfall, or enjoy family adventures, with underground caverns and amazing castles. The Celtic Camper Company invites you to create your own unique VW adventure in Wales, and enjoy a holiday experience that you will never forget for all the right reasons! 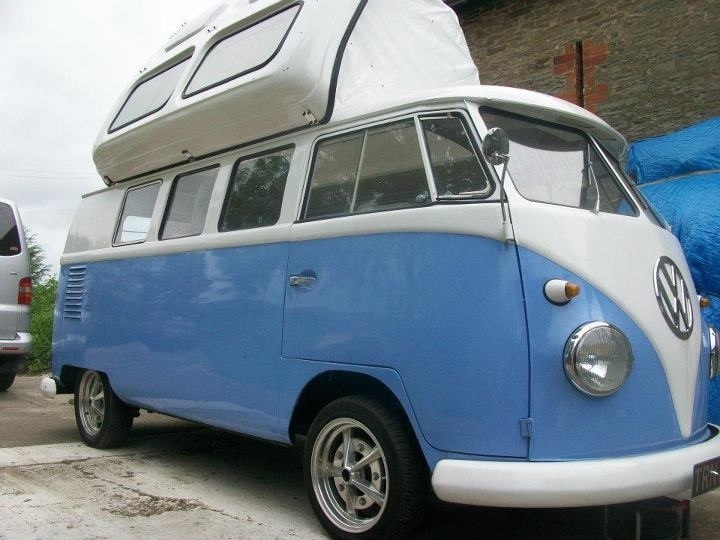 VW Camper Hire Company Description: We are a friendly, family run VW camper van hire company, based in Gwynfryn, North Wales, close to Wrexham and the gateway to beautiful Snowdonia National Park We have two lovely Classic VW Campervans for you to hire for long weekends. short weeks or full weeks. You have the freedom to tour wherever you want at a leisurely pace, not forgetting to wave to fellow VWs en route! Fully equipped with everything you need, just bring some food, clothes and bedding and you're good to go! 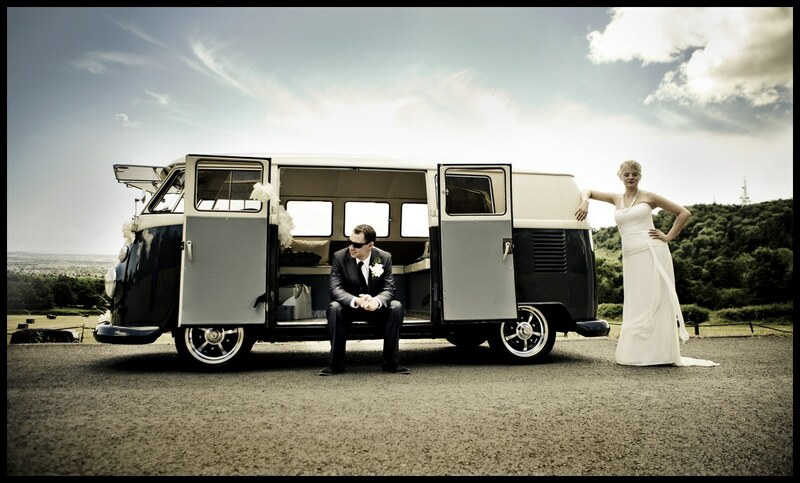 VW Camper Hire Company Description: Arrive at your Wedding in a retro and fun way in one of our stunning vintage VW vehicles. The highest standard vehicles available for Wedding HIre in the UK. CHoose from a 23 window 1963 Samba, 11 window 1963 Split Screen, 1958 Karmann Cabriolet Beetle and a 1966 type 3 Variant for the Groom. Packages start from ?250. 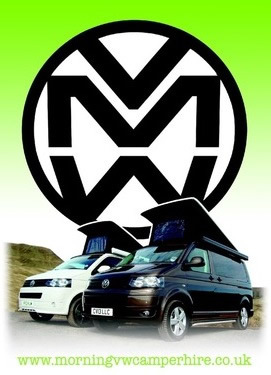 VW Camper Hire Company Description: Cardiff, south wales based self drive holiday hire or chauffeur driven wedding hire. Providing a friendly and professional service with a lovingly restored bay window VW camper. 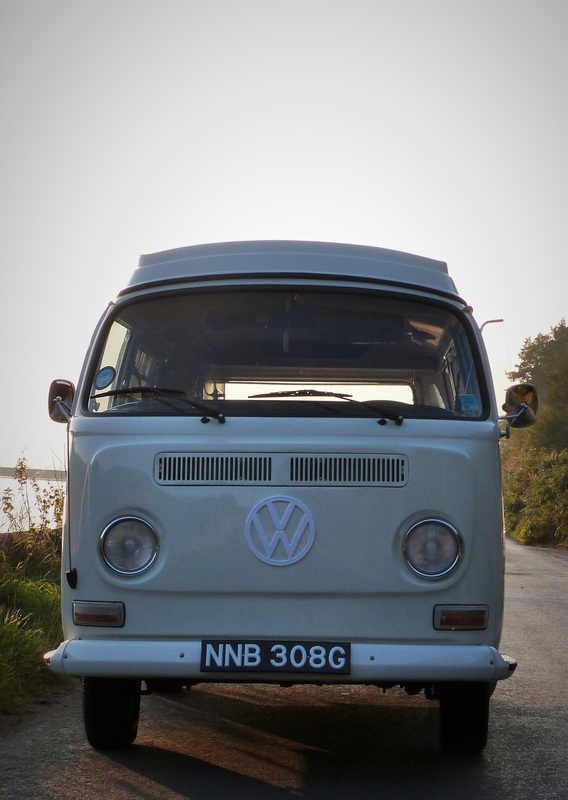 VW Camper Hire Company Description: Campervan hire from Morning VW Campers Limited is a fantastic way to explore all that Wales and the rest of the UK has to offer, from beautiful countryside and beaches to historic towns and iconic castles. Our fully equipped VW campervans Rex and Dave come with everything you need for a holiday to remember at a price you can afford. We know there are other companies out there offering a similar experience to ours but we strive to go that little bit further for our customers. We offer short breaks Friday To Monday, Monday To Friday and week long breaks Friday To Friday. 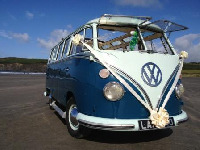 VW Camper Hire Company Description: VW Splitscreen Samba Wedding Hire in South and West Wales. Retro Retreats is an award winning wedding transport company, who aim to make your Wedding day a day to remember! 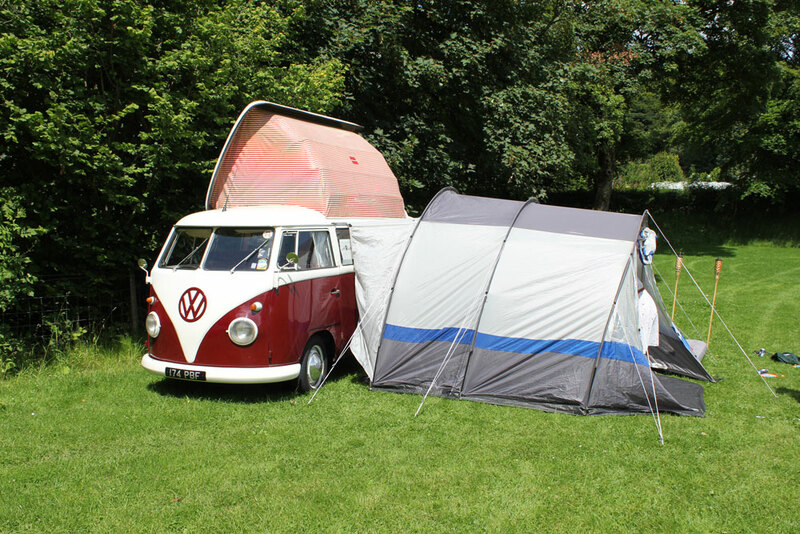 VW Camper Hire Company Description: Come and experience the freedom and nostalgia of hiring a Split the Difference Vintage Split Screen Campervan and share our "Home is where you park it" philosophy. Whether you are a thrill seeking adventurer or need to take a ride in the slow lane, to do your own thing in your own time then Split the Difference is the holiday for you. You can also arrive in style and hire a classic iconic split screen campervan for weddings and honeymoons. Relax under starry skies with a beachside campfire at Harlech. Experience the romance of the hidden coves of Anglesey. Discover the ancient history of the Castles of North Wales. Challenge the awesome mountains of mighty Snowdonia. Hire a classic self drive VW camper to cruise the open road for a truly unique get away. 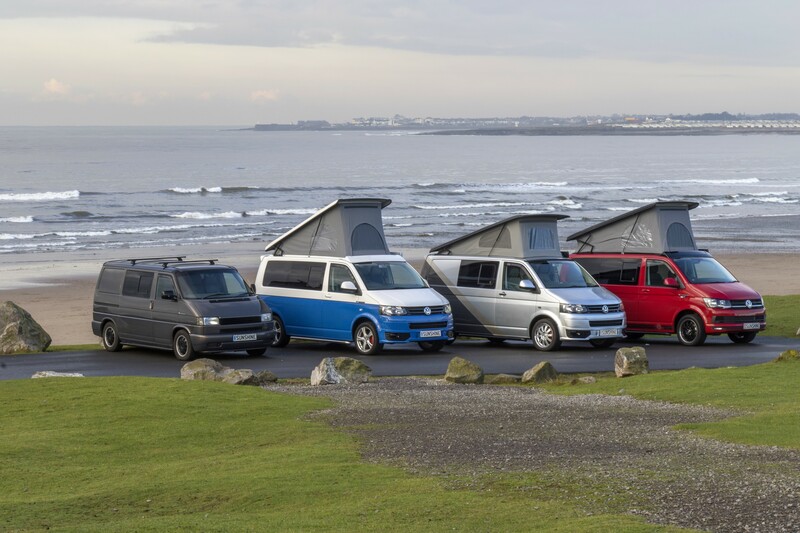 VW Camper Hire Company Description: We are a family run camper van hire company with a great selection of modern VW 4 berth campervans.Our location is just 5 minutes off the M4 at Bridgend South wales. Just an hour from the Gower and 1.5 hrs from Tenby. 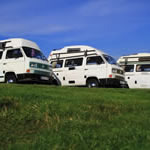 VW Camper Hire Company Description: Van goch VW campervan hire is based in the City of Cardiff, Wales? vibrant capital. We are close to the beautiful mountains of the Brecon Beacons (home of Brecon Jazz festival and close to the Greenman festival) and the stunning coastline of the Gower estuary. Being in the centre of Cardiff enables you to pick up the campervan at your convenience, and drive off to the countryside within minutes. Fancy a weekend away, surfing in the popular area of the Gower? Or a week?s holiday exploring Wales? hidden treasures? Or what about staying in a campsite within 4 minutes walk of Cardiff?s city centre? Whatever your needs, hiring a luxury VW campervan enables you to stop off at your leisure, safe in the knowledge that you have a dry roof above your head. 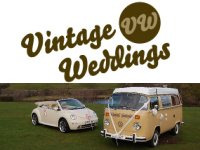 VW Camper Hire Company Description: Here at Vintage VW Weddings we bring you the best selection of Vintage Volkswagen Wedding vehicles for hire in South Wales & Bristol areas Our 8 stunning show winning Vintage Volkswagen Vehicles include four campervans and four cars. With this awesome collection there is guaranteed to be a vehicle here to please everyone and will provide that unique touch on your wedding day that will be remembered for years to come. VW Camper Hire Company Description: Based at the gateway to Wales, Hereford, close to the M50, M5 and A49, we are ideally located to travel all over Wales, Shropshire, The Forest of Dean, The Wye Valley, The Midlands, North Devon, Somerset and The Cotswold's in these Classic Volkswagen Camper Van Camper's. 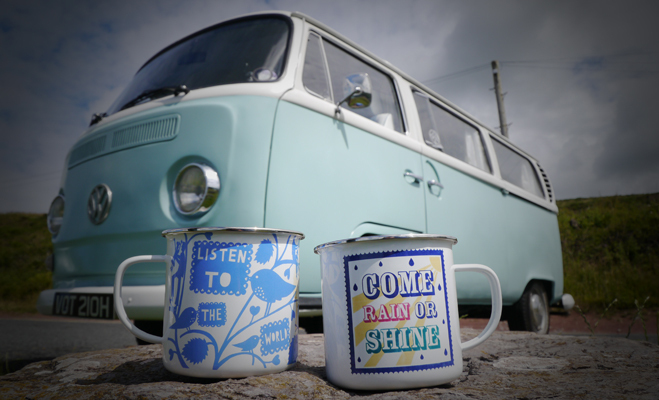 So park your car with us, relax and enjoy your VW Camper experience. 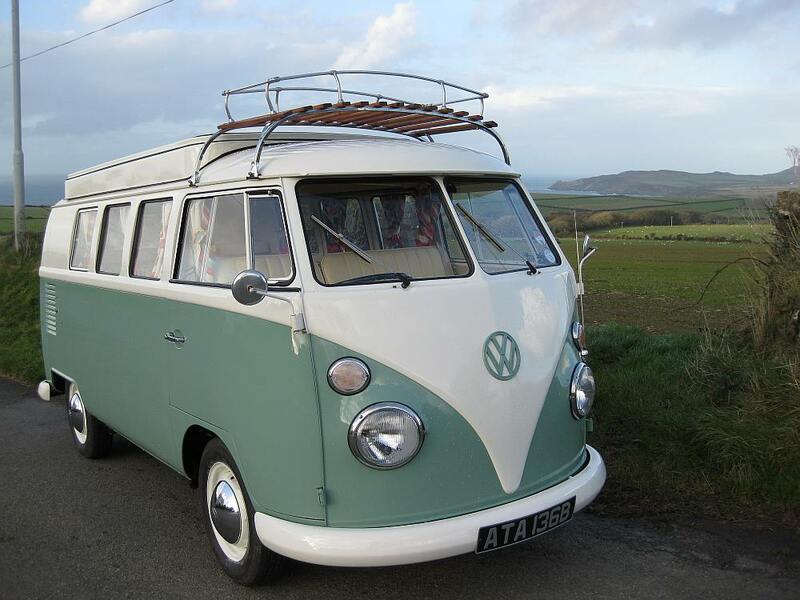 VW Camper Hire Company Description: Explore North Wales in vintage style in a 1969 VW Westfalia campervan. Available for weddings, proms, honeymoons and holidays. VW Camper Hire Company Description: Wye Campers VW Campervans hire specialising in splitscreen s and bay window t2 campers.